Say hello to springtime and kiss the dreary winter days good-bye with this bright, cheery Easter arrangement! 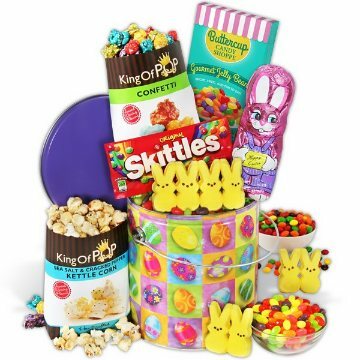 We've filled it with festive items, like a beautiful stuffed bunny, gooey marshmallow treats, and crisp gourmet popcorn, creating a wonderful gift that's sure to make this Easter one to remember! This gift includes the following: Jelly Beans by Buttercup Candy Shoppe - 3.5 oz., Peeps - Assorted, Sea Salt & Cracked Pepper Popcorn - 1.4 oz., Confetti Popcorn - 3.11 oz., Double Crisp Chocolate Bunny - 4.25 oz., Original Skittles - 2.17 oz.